I love doing Six Degrees of Separation, a monthly link-up hosted by Kate at Books Are My Favourite and Best. Each month a book is chosen as a starting point and linked to six other books to form a chain. A book doesn’t need to be connected to all the other books on the list, only to the one next to it in the chain. 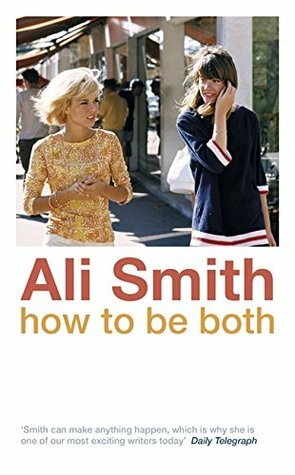 This month (April 6, 2019), the chain begins with Ali Smith’s award-winning novel, How to be Both. I haven’t read this book but I’d like to sometime. I see that there are two versions: one begins with the contemporary story, the other with the 15th-century story. This reminded me of Carol Shields’ book Happenstance, two stories about the same five-day period – one from Jack Bowman’s point of view, and the other from his wife, Brenda’s. They’re printed in the same book in an unusual format of containing two books in one, either can be read first – then turn the book upside down and read the other story. My next link is a bit of a jump – from the character Brenda in Happenstance I immediately thought of Brenda Blethyn, who plays Vera in Ann Cleeves’s books. One of these books is Silent Voices in which D I Vera Stanhope finds a dead body in the sauna room of her local gym. The victim, a woman had worked in social services – and was involved in a shocking case involving a young child. Social Services also feature in Fair of Face by Christina James. Ten year old Grace is being fostered when her foster mother and her baby are found dead in their beds. Social Services are asked to work with the police, in order to question Grace and her friend Chloe, a child from a troubled family. Another author with the name James, is P D James, also a crime writer. An Unsuitable Job for a Woman is a Cordelia Gray detective story in which she takes on an assignment from Sir Ronald Callander, a famous scientist, to investigate the death of his son, Mark who had been found hanged in suspicious circumstances. Mark had left Cambridge University without completing his degree and had taken a job as a gardener. My next link is to Agatha Christie’s Cat Among the Pigeons, set mainly in an exclusive and expensive girls’ school, Meadowbank, in England. Some new staff members have been appointed, including Adam Goodman, a handsome young gardener. My final link is to another school, the Marcia Blaine School for Girls in Muriel Spark’s novel, The Prime of Miss Jean Brodie. Marcia Blaine is a traditional school where Miss Brodie’s ideas and methods of teaching are viewed with dislike and distrust. The Head Teacher is looking for ways to discredit and get rid of her. The girls in her ‘set’ fall under her spell, but one of them betrays her, ruining her teaching career. Different formats, the name ‘Brenda’, Social Services, authors’ surname ‘James’, gardeners, and girls’ schools all link How To Be Both to The Prime of Miss Jean Brodie. Except for The Prime of Miss Jean Brodie the books in my chain are all crime fiction and apart from How To Be Both I’ve read all the books in the chain – clicking on the titles takes you to my posts, where they exist. Next month (May 4, 2019), the chain will begin with Jane Harper’s debut best-seller, The Dry.